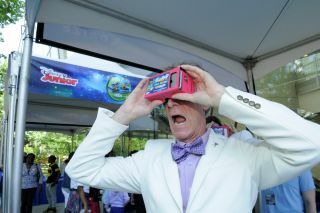 Bill Nye joined NASA astronauts Mike Massimino and Yvonne Cagle as well as "Miles from Tomorrowland" star Adrian Grenier and "Good Morning America" Chief Meteorologist Ginger Zee at a New York Hall of Science kickoff event for "Miles from Tomorrowland: Space Missions," a science, technology, engineering, arts, math (STEAM) challenge for young children. A summer challenge sponsored by X Prize and Disney Junior invites kids ages 2 to 8 to develop "out-of-this-world" creations — and the grand prize is a trip to Florida's Kennedy Space Center to see a SpaceX rocket launch. Celebrities kicked off the challenge, called "Miles from Tomorrowland: Space Missions," last month at the New York Hall of Science by leading children in STEAM-based art projects and activities. The challenge, which will accept online submissions until Aug. 31, is inspired by Disney Junior's new science, tech, engineering, arts and math (STEAM)-focused TV show "Miles from Tomorrowland." The technology award organization X Prize is well known for a $30 million series of lunar mission milestone awards co-sponsored by Google, and it has teamed up with Disney before for a video contest focused on older kids. Left to right: Yvonne Cagle, Nancy Kanter, Sascha Paladino, Ginger Zee, Bill Nye and Mike Massimino led children ages 2 to 8 in STEAM art projects and activities. Scientist and TV personality Bill Nye — who, in addition to his "Science Guy" fame, is CEO of space advocacy nonprofit The Planetary Society — was also on hand duing the contest's July 16 launch. Nye, who is a voice actor and guest star on the "Miles from Tomorrowland" show, joined the kickoff event to help get children involved in the sciences. "Science and technology are the key to our future, so it is imperative that we get young people engaged in these fields as early as possible," he said in a statement. "'Miles from Tomorrowland' is already part of that, and I think this challenge that Disney and X Prize are presenting will inspire kids with the message that they can do anything — create machines, spaceships, vessels to travel anywhere they want to explore." For the contest, children can design futuristic technology, build a cardboard spaceship or illustrate alien planets to explore. Families with the best projects can win a trip to watch a SpaceX launch, 3D printers or Google Cardboard 3D viewers. Ginger Zee led children ages 2 to 8 in space-based activities at the "Miles from Tomorrowland: Space Missions" kickoff event at the New York Hall of Science. "We're excited to be partnering with X Prize as we look to enthuse young children about their role in building our future," Nancy Kanter, Disney Junior Worldwide's executive vice president and general manager, said in the statement. "Since launching 'Miles from Tomorrowland,' we've heard from parents that their children are asking questions and wanting to know more about space, science and technology. We hope this initiative will build on that interest and inspire this generation to become leaders in the STEAM fields."